Home Costs > How Much Does it Cost to Widen a Driveway? How Much Does it Cost to Widen a Driveway? Homeowners often widen their driveway for a variety of reasons. This can include storing more vehicles, a new RV or to simply create more room. If your current driveway doesn’t provide enough room, you may be considering widening it. 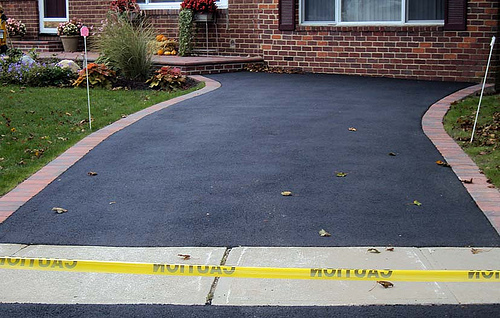 The cost to widen a driveway depends on a lot of factors. Since there are different kinds of materials that you can use for a driveway, the cost can be different depending on the type of materials that will be used. The most common materials used, for example, are asphalt and concrete, and asphalt is the cheapest between the two. The size of the driveway will also determine the total cost of the project since more materials will be used. On average, plan on spending anywhere between $5 to $20 per square foot to widen a driveway with concrete. To widen a driveway with bricks or stamped concrete, the price could be as high as $150 per square foot. In the end, the costs to widen a driveway will depend on how you want to widen your driveway (both sides or one? ), the driveway material you choose and the contractor you choose. BuildingJournal.com offers a calculator which can calculate the total cost per square foot of the project. If you are located in Long Beach, California, for example, you can expect to pay anywhere from $118 to $204 per square foot for a paved and brick surfaced driveway. According to PaverSearch.com, driveways can be widened for $15 to $100 per square feet depending on the material. Members on City-data.com discussed this very question and a few talked about their quotes. One member was quoted $4.80 per square foot for a blacktop extension, with an additional $100 to install a french drain, while another member was quoted $14 per square foot for a concrete driveway widening job. If you are going to hire a contractor to widen your driveway, he or she will first want to come to your home to assess the project and then give you an estimate, often free, of the final price. This price should include the materials and labor so there are no surprise costs to you in the end. It’s important to ask for an itemized bill to make sure you know where you’re paying for. A driveway extension will be no different than installing a new driveway. It will involve excavating the new area, setting up the driveway base and installing the extension with your material of choice. They will also ensure the new extension will remain stable for years to come. You may need to obtain a building permit from your local government office for the construction. The price will depend on your location. Some cities, for example, may not allow you to cut at the curb. Depending on your driveway setup, you may have to relandscape the area around the new driveway. The costs could be very minimal if you want to plant grass or more extravagant if you wanted to replant trees or bushes. A driveway extension on a slope could mean drainage issues, which could cause flooding problems in the future. Because of this, a drain may need to be installed to prevent this problem. Adding a new slab of concrete could, of course, widen your driveway, but keep in mind the colors won’t match up since the newer concrete will look much fresher than that of your older concrete. However, if you were to add asphalt, you could simply seal coat the entire driveway when done to prevent the mismatch of colors. If you want to hire a professional but don’t have the time or don’t know where to look, consider getting multiple quotes from HomeAvisor.com. It’s free and all bids come from licensed contractors in your area. Even if you don’t want to use a service like this, you can still contact contractors on your own as most are willing to offer a free estimate as long as you’re within their working radius. Oftentimes, widening a driveway with pavers can be a cheaper option, especially if you were to use a local landscaper. Refer to these Pinterest pictures for inspiration.